CHARLES HARKNESS. was a son of early Standard Oil investor Stephen Vanderburg Harkness. He studied and practiced law, before joining Standard Oil, where he was active in management and as a director, one of the few scions of the founding families to do so. C.W. Harkness also invested heavily in railroads and was a director in the Southern Pacific, the Chicago Milwaukee & St.Paul and the Baltimore & Ohio railroads. Charles William Harkness married Mary Warden, heiress to another Standard Oil fortune, but they had no children. He managed the family's money until his early death in 1916. 1901, Maryland & Ohio. 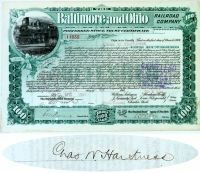 B & O Stock certificate for 100 shares of the Baltimore and Ohio issued to and signed by “Chas. W. Harkness” on verso. Green borders and under printing. Top left engraving of a 4-4-0 locomotive moving down the tracks at full throttle. Stamp and punch cancelled, though not affecting the dark autograph in any way. Fine condition.